Have you ever planned your trip and due to sudden weather changes or maybe aviation failure encountered a “cancelled flight” status on flight status board just after reaching with loaded luggage? If yes, then you might have despondently sighed and thought of how to recover that flight cancellation compensation, for sure. But could have possibly dropped the idea because of how questionable and hassle-filled it sounds to claim compensation for a cancelled flight. If you are one of the sufferers, continue reading to know the exact and easy way to retrieve your sum without much pressure and time. If your flight is cancelled due to any sudden reason, you can either ask the airport staff to get you in a next departure or can ask for a full-fledged refund. You can even rebook yourself to an alternative flight with the help of an airline’s website or app. These are the possible just in minute options you can try by aligning with the airport authority. How air ticket refund and flight compensation are different? Before moving ahead with- when the compensation is redeemed, first, passengers need to make a note of two terms as follow, whenever seeking a claim for a cancelled flight. 1. Refund– It is the full amount of the ticket that is implicit of base fare, taxes, surcharges. In short, it is the one-way ticket price that user pay while buying a ticket. 2. Flight compensation – It is an additional perk that is paid along the refund to cover the turmoil faced by the passengers. Note – The above two terms are different and are demanded separately in case of cancelled flight compensation. There are mere two situations in flight cancellation, one when airline authority informs about such cancellation and second when passengers are clueless or are uninformed from the airline’s part. 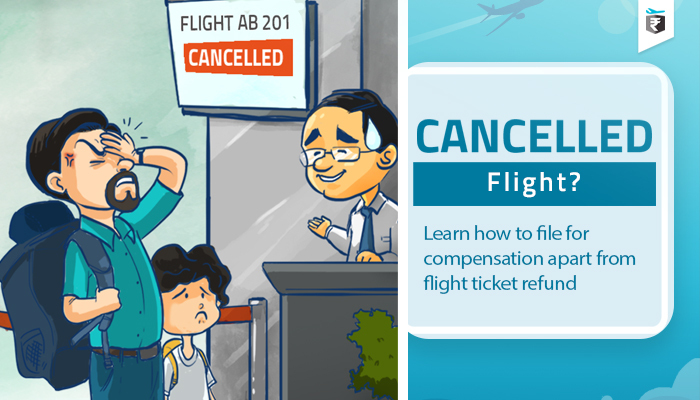 What to claim when flight cancellation is notified? The passengers will be reimbursed with the following benefits when the flight cancellation is informed to air passengers. What to claim when the flight cancellation is not notified? The passengers can seek for a compensation along with the prescribed refund amount, in case airline fails to inform about the cancellation. Note – In case you are wondering what is block timing, then it is stipulated time between which an aircraft moves from it departure place and reaches to the destination place. But how can I claim my compensation? It is a simple 3-way step in which you can get your compensation without even going to the airport authorities. 1. Visit refundme.in- To get the flight cancellation compensation, visit the website of refudme.in and in a widget there enter the flight itinerary. 2. Filing complaint on behalf of passengers- The team will look into the matter and lodge a complaint all by self. 3. Enjoy the credited amount- Check your bank balance and see that amount for the compensation. Now the power is all yours, you can get your flight cancellation compensation in India by just reaching to the website of refundme.in while working on your daily routines.